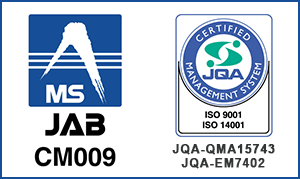 Nagata Tekko Co., Ltd., attained ISO 14001:2004 certification in 2008. We are working hard from many angles for environmental preservation. We commemorate events such as for new employees or the birth of an employee’s child by planting trees, and the green is spreading across our 50,000㎡ site, reaching 30% greening. The wastewater treatment facilities we built on-site are managed properly by strict management procedures. We are also putting our effort behind the maintenance of our surrounding area, conducting cleanings of the factory and its environs once a month. Nagata Tekko contributes to society through the production of precision gears, grounded in an ecologically-aware understanding of efficient use of resources, advancing its business activities with forethought to the preservation of local and global environments. 1. Our manufacturing activities are designed to fulfill the requirements of every industry as we observe environmental legal regulations and any specified requirements to which we have agreed. 2. We work to continuously improve our environmental management system. Everyone who works here puts our environmental conservation program into practice with self-determined environmental goals and targets, subject to periodic review. 3. By keeping track of the ecological aspects of our business activities, we drive forward in energy conservation, waste reduction, and recycling, and we manugacture gears keeping all facets of resource conservation in mind. 4. We raise the environmental awareness of everyone who works here, nurturing talent that takes initiative to protect the environment, including the immediate environment, and thus contributing to the local community. We pledge disuse of legally prohibited substances in our activities. For the environmental policy, we request understanding and cooperation, informing not only all the staff in our company but also our customers. This environmental policy is disclosed to the requests from outside the company.